July 30, 2012  GOP presidential hopeful Mitt Romney traveled to Israel over the weekend, causing a stir with comments about Iran and other issues. He then gave interviews clarifying the remarks. Next, he travels to Poland. July 28, 2012  The debate over which country hosted the better Olympics opening ceremony — China or the U.K. — has begun, and one person who's finished making comments about London is presumptive GOP candidate Mitt Romney. His thoughts about the games in London were not well-received. Weekends on All Things Considered Guy Raz speaks with James Fallows of The Atlantic for his perspective. Will Colo. Shooting Change Gun Debate? July 24, 2012  Last week's movie theater shooting in Aurora, Colorado is raising questions about America's gun laws and gun culture. Host Michel Martin speaks with Paul Barrett, author of the book, "Glock: The Rise of America's Guns." They discuss whether this mass shooting has the potential to change public opinion and laws about guns in the United States. July 23, 2012  Even as the country grieves over the mass killings in Colorado — a major battleground in the coming election — the public policy and political fallout has become part of the story. July 21, 2012  Weekends on All Things Considered host Guy Raz is joined by James Fallows, national correspondent for The Atlantic Monthly. They discuss the tragic pattern of mass shootings in America and abroad and the limited effect that the Aurora shooting will most likely have on preventing the next such event. July 16, 2012  President Obama will be holding his first big town hall meeting of the 2012 campaign in Cincinnati Monday. And he will probably continue his campaign attack on Mitt Romney's record of what Democrats characterize as sending jobs abroad while he was the head of Bain Capital. July 14, 2012  The Mitt Romney campaign has been busy this week fending off attacks about Romney's involvement with Bain Capital after he claims to have ceased dealing with the company's day-to-day operations. Weekends on All Things Considered host Guy Raz speaks with James Fallows of The Atlantic about how this episode reminds him of the "Swiftboat" attacks against Democratic candidate John Kerry in 2004. July 9, 2012  The scandal over manipulation of a key interest rate raises the question: Who was hurt if bankers were pushing global rates down? July 9, 2012  On Friday, the Labor Department reported that fewer jobs had been added to the work force than economists had expected. Plus, the unemployment rate stayed stuck at 8.2 percent. Unsurprisingly, Republicans pounced on those numbers to make their case for defeating President Obama. July 7, 2012  There's been a paradigm shift in the NBA: Older players are signing huge new contracts. This week was the most recent example, with Steve Nash and Kevin Garnett signing huge deals even though they're approaching 40 years old. July 2, 2012  Members of Congress have left town for their July 4 recess but Washington is still reacting to the Supreme Court decision upholding President Obama's health care law. Each party is looking for ways to use the decision to its advantage in the fall campaign. June 30, 2012  Weekends on All Things Considered guest host Laura Sullivan talks with James Fallows, national correspondent for The Atlantic Monthly. They discuss the decision of the Supreme Court to uphold the Affordable Health Care act, Chief Justice John Roberts' role on the court and what the decision means in this election year. June 27, 2012  In advance of the Supreme Court's ruling on the Obama health care law, Renee Montagne talks to Jamal Greene — associate professor at Columbia Law School and former clerk for Justice John Paul Stevens — about how the Supreme Court thinks through momentous cases. June 23, 2012  Weekends on All Things Considered host Guy Raz is joined by James Fallows, national correspondent for The Atlantic Monthly. They discuss immigration policy in an election year. Both President Obama and his rival Republican Mitt Romney addressed Latino politicians this week, and both candidates are vying for Latino voters this fall. 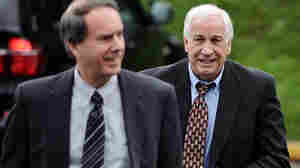 June 21, 2012  Details behind the sexual abuse charges against former Penn State assistant Jerry Sandusky.